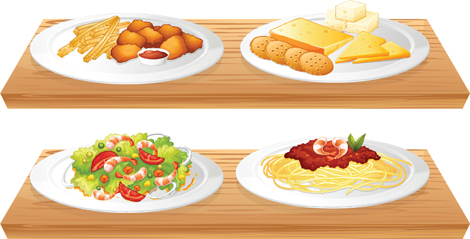 When it comes to what clipart collection I intend to be sharing today, it could be said that I'm serving up an all-you-can-eat smorgasbord. Since food has been a big part of all the recent festivities surrounding the festive season, it's been on my mind a lot lately. From the delectables served up during the holiday gatherings, the Christmas feasts and the New Year's Eve celebrations, food has been front and centre. Like most mothers, the fixation with festive fare began well ahead of the actual parties with time spent preparing, baking and cooking. Our ovens got a workout as kitchens filled with the fragrances of homemade shortbread and gingerbread. The percussion of chopping and paring set the rhythm as appetizers and chafing dishes were made ahead for convenience when the busy days arrived. For working women, all of the extra work can often prove stressful. It's not easy to try and meet the demands we put on ourselves. Our attempts at squeezing in more responsibilities between the already full hours of our lives can be challenging. Knowing that all of these tasks must be done is a lot of pressure. In order to cope, shortcuts might be found, most frequently in the form of convenience food purchased from retail outlets. Or, worse yet, some of the items on the list, quite simply don't happen. The latter was exactly how I saw things working out this time. As I considered the jobs that needed to be accomplished, as I thought of them in terms of when they could be attacked between work hours and social commitments, I felt a momentary panic that the favourite dishes my family had come to expect from me during the holidays weren't all going to make it to our meals. As the weeks moved closer to the holidays, I strangely began to relax though following the rule I've always applied to my work in the kitchen. Just push up my sleeves and enjoy. 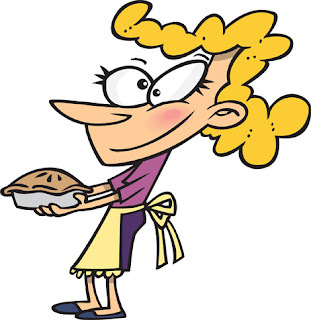 Then rolling out pastry one evening I noticed a sense of calm wrapping itself around me. The same thing happened as I kneaded the dough for coffee cake a few days later. Rather than worry about what I might not get done I allowed myself to be in the moment. As a result, instead of letting the work own me, I remembered how much I enjoy preparing food for my family, and the fact that it always provided me with an equal amount of pleasure to watch them enjoy the dishes before them. Of course, with the arrival of a brand new year, and the festivities all behind us, my efforts in the kitchen have been curtailed somewhat. Neither my husband nor I have any need for desserts and treats given that any little extras tend to stay with us in places we'd rather they didn't. As well, after so many heavy foods, it's time to consider healthier entrées, more salads, fewer carbs. While I'm always (unfortunately) more interested in the preparation, and consuming, of comfort foods, I recognize that these are best served in small doses and rare occasions. So now I turn my culinary interests to making the simple and plain enticing. My focus for 2018, I guess a resolution of sorts, is to find the same kind of pleasure in making those dishes as I do in preparing hearty homebaked breads and desserts. Though my mind might be turned away from the decadent to nutritious for the moment in the practical sense, the images in these great clipart collections from iCLIPART.com and Clipart.com offer a veritable buffet of good eats– from meat and vegetables to treats and junk. They're perfect for any number of projects. Some of them, I know, will be making their way into a cookbook of my family favourites I'm creating for my brood.